Experiments with bone cell or crushed bone fragment transplants placed under the kidney capsule in syngeneic and allogeneic combinations of mice demonstrate the transplantation reaction to bone allografts. At six weeks after transplantation in the syngeneic combination there is bone development under the kidney capsule. The bone is organised as an ossicle which forms marrow spaces populated by normal bone marrow in both the case of a bone cell transplant and a crushed bone transplant (Fig. 1.1a,b). In the allogeneic combination of mice, there is no bone present and a strong inflammatory response with many lymphocytes which can destroy the graft. 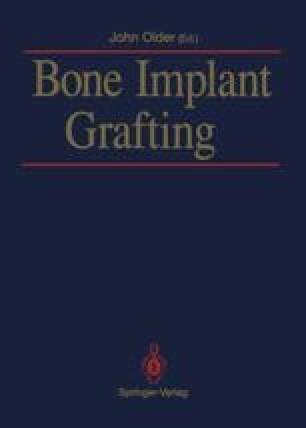 This finding is seen in both the case of the bone cell transplant and the crushed bone allograft. (Fig. 1.1c,d).